Students at South Ogden Jr. High School gather around Bentley in the library. SOUTH OGDEN, Utah (KSL via CNN Wire) -- From the outside, South Ogden Jr. High School looks like any other school in Utah. Even the inside isn’t out of the ordinary. That is, until you head to the library. Students who go inside the library are getting better reading scores. It’s not that the books are different or even the assignments students are given. It’s not every day you see a dog in a library; especially a goldendoodle as docile and friendly as Bentley is. “Awww,” several students say as they walk into the library and see Bentley. 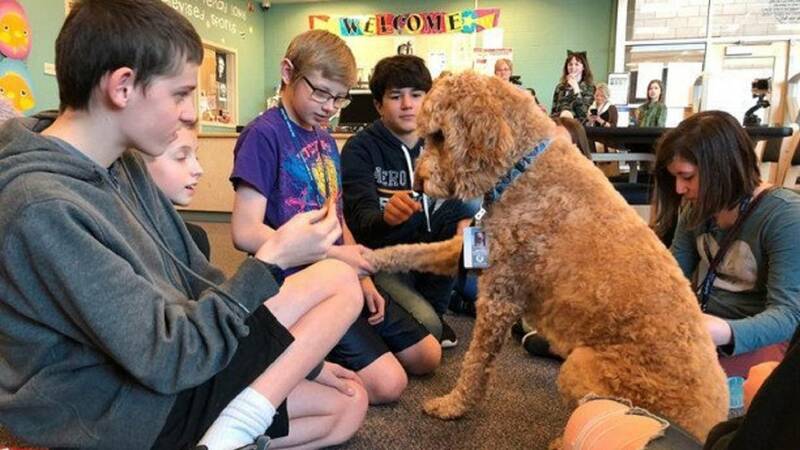 Beyond petting a dog at school, though, it seems students who may not feel comfortable reading to their classmates have no problem reading out loud to Bentley. The research Irvine did backs it up. Maybe it’s because Bentley doesn’t care if a student reading to him is popular, athletic, or not. Bentley just sits there listening to every word. “I did not like reading at all. Like, not one bit,” said ninth-grade student Matthu Martinez. However, after reading out loud to Bentley throughout the past few years, Martinez now loves to read. He says it helps to give Bentley treats, and in return, Bentley just helps. Bentley, with his student picture ID hanging from his collar, has been part of the student body for four years now. His owner is Paul Woodin, the school librarian, who started bringing him in as a puppy after getting permission from the superintendent. “He said if you can get him certified as a therapy dog, he’ll be OK with him to be here,” said Woodin. Ever since then, students stop by the library just to say “hi” to Bentley. Sometimes, Woodin brings the dog just outside the library doors between classes so students can pet him as they walk to their classes. “It’s been personally satisfying to see students interested in coming to the library, maybe checking out a book. It’s been satisfying,” said Woodin. Not only are English and reading test scores up but so are library book checkouts. It’s proof maybe all it takes to read better is reading to someone who can’t.